Authors: Kozhevnikov V.V., Voronchikhin E.V., Grigoricheva L.G., Radimova Z.N. Introduction: Congenital clubfoot is a complex orthopedic problem, and the frequency of recurrence or secondary deformities may reach up to 60% in some cases. Purpose: To determine indicators for the surgical treatment of recurrent foot deformity using the Ilizarov external fixator and to evaluate the effectiveness of this approach. Materials and Methods: The feet of 78 children with recurrent congenital clubfoot were analyzed using X-ray and ultrasound to investigate their clinical and functional characteristics. According to the characteristics of the deformity, we performed tenoligamentocapsulotomy combined with tarsal osteotomies and tendon plastics. Furthermore, we determined the indicators for the surgical treatment of foot deformity using the Ilizarov external fixator. Results: In total, 33 children (56 feet) were treated using a distraction external fixator combined with tenoligamentocapsulotomy. Following treatment, long term results were assessed using a three-point scale: good, satisfactory, and unsatisfactory. The number of children of 8 years of age whose treatment was graded as either good or satisfactory was higher than children who were over 9 years of age. Functional recovery was also better in the younger age group. Conclusion: By determining specific indications for different treatment methods, physicians are able to apply an individual approach for diagnosing and treating recurrent congenital clubfoot. Good and satisfactory long term results were obtained in approximately 90 % of cases. Congenital clubfoot is one of the most common musculoskeletal deformities. Treatment is necessary as clubfoot tends to be recurrent and results in the development of multiplanar foot deformities if not treated. The urgency of the treatment required is related to the presence of severe and atypical forms of this deformity. The fundamental approach to managing clubfoot is conservative treatment, and Ponseti method is a gold standard with this approach [1−3]. Nevertheless, for reasons beyond the control of orthopedic specialists, such modern standards of corrective treatment may still fail. According to some authors, the frequency of recurrence is as high as 60% . Patients often visit orthopedists on an irregular basis, sometimes in intervals of 3 years or longer between appointments. As a child continues to grow, secondary bone defects develop due to the load on the deformed foot. These bone defects are particularly evident on the superior articular surface as well as the talar head when there are signs of its rigid dislocation relative to the ankle mortis. Deformities leading to incongruent ankles are the most functionally important defects because they affect foot support and gait . The treatment of rigid foot deformities using minimally invasive surgery or extensive release techniques is often ineffective [5, 6]. In such cases, the method of choice is correction with external devices in combination with tenotomy and/or ligament-sparing capsulotomy. The objective of this study was to determine the indications for surgical correction of recurrent congenital clubfoot using Ilizarov external fixator apparatus and the assessment of its efficacy. 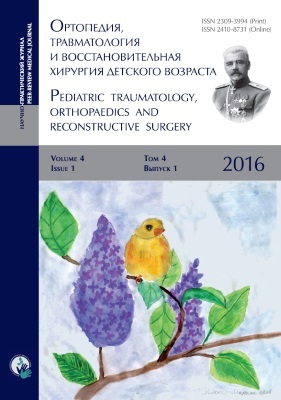 Between 2004 and 2013, 78 children (131 feet) with recurrent clubfoot, including atypical forms (arthrogryposis, neurogenic form, and amniotic band constriction of the lower leg), were treated at the Department of Traumatology and Orthopedics at the Altai Regional Clinical Children’s Hospital and at the Federal Center of Traumatology, Orthopedics and Endoprosthesis in Barnaul. The number of children with bilateral clubfoot was more (55) compared with that of children with unilateral clubfoot; furthermore, severe deformity cases predominated. The age range of children was 16 months–12 years. The patients were divided into three age groups: Group 1, age 16 months–3 years, comprising 22 patients (31 feet); Group 2, age 4–8 years, comprising 38 patients (69 feet); and Group 3, age 9–12 years, comprising 18 patients (31 feet). During clinical examination and orthopedic status assessment, in addition to assessing the nature and degree of deformation, the active and passive range of motion in the ankle joint was evaluated. Furthermore, the preservation of passive mobility in the subtalar joint was evaluated (Table 1). Notes: 1. Active ankle dorsiflexion is the ability of the patient to actively extend from the original position (marked as 0°) to an extension angle; 2. The passive range of motion was evaluated manually; 3. Preservation of movement in the talocalcaneal joint was evaluated by severity: “++”, clear manifestation; “+”, minimal manifestation; and “−”, no manifestation. The preliminary treatment plan was developed in accordance with the examination results. The treatment goal was to achieve not only correction of the foot deformity but also to restore maximum possible foot function. In young children (up to 8 years old) with recurrent deformity of anterior-midfoot section (varus-adducted deformity) alone or in combination with partially corrected equinus (medium-severity equinovarus-adducted deformations), the surgical correction included the following steps: release of the foot joints, tendon and muscle plastic reconstruction (elongation and transposition of tendons), restoration of joint structure, and extra-articular corrective osteotomy of the tarsal bones (cuboid, navicular, and medial cuneiform). This surgical correction approach was used in 45 of 78 children with recurrent congenital clubfoot. The results were considered unsatisfactory if all the elements of deformity were present, foot function was severely deficient (active and passive range of motion no more than 10°), walking was accompanied by claudication and pain, and X-ray demonstrated deviation of all parameters by more than 20% from the normal range. Deformity correction with Ilizarov apparatus was required in 33 children (56 feet). The indications for this type of correction were as follows: the presence of the rigid foot equinus of no less than 120°, passive range of motion less than 30°, foot shortened by 3 cm or more, bone displacements in the ankle and transverse tarsal joints with anterolateral talus subluxation (talocrural angle more than 130° and TCA less than 10°), and presence of talus deformity (flattening of the talar head and trochlea tali). Assembly of the Ilizarov apparatus was planned according to the characteristics of each foot’s deformity. A release surgery, tenotomy, or ligament-sparing capsulotomy was always performed prior to applying the apparatus. Subsequently, the deformity was gradually corrected to reposition the talus into the fork of the ankle joint and to create an optimal arthrodiastasis (joint distraction) at the joint level. The feet were put in a position of 75–80° dorsal overcorrection. The period of fixation was 1 month, during which patients underwent iontophoresis therapy (calcium and phosphorus applied on the foot and lower leg and nicotinic acid on the lumbar paravertebral area). Patients were allowed to walk in custom-made shoes that enabled correct load distribution. Note: the results of treatment were calculated as percentage of the total number of treated feet. It may be inferred, that deterioration of post-operative function in younger children is due to more aggressive formation of a secondary scar tissue in the previous surgical release area and also due to their lower rehabilitation potential (i.e., lack of ability to undergo rehabilitation exercises or correctly control their gait). In Group 3, anatomical and functional treatment results were not very positive, even with the use of the Ilizarov apparatus. Good results were achieved in only 6 feet (42.8%). In Group 3, patients whose X-ray images showed significant deformity (flattening) of the trochlea tali and articular surface of the calcaneus, 35.8% of the feet achieved satisfactory results, while 21.4% achieved unsatisfactory results. In older children with severe anatomical foot deformities, where full correction was not possible, the use of external fixation apparatus was a preparatory step for subsequent triple subtalar arthrodesis. Such arthrodesis does not result in significant shortening of the foot. In total, good and satisfactory results were achieved in 87.5% of the surgical cases (33 children, 56 feet); 14.3% of the cases (8 feet) experienced complications, of which only one patient, a 10-year-old child with a severe foot deformity, experienced necrosis along the margin of the suture (in the release area). In the remaining 7 cases, complications included skin surface inflammation along the projection of pins on the foot. Repositioning the pins and dressing the wounds with dimethyl sulfoxide (DMSO) solution (1:5) eliminated the symptoms of inflammation and did not affect the treatment efficacy. 2. This treatment allowed nearly 90% of the cases to achieve good and satisfactory results. 3. In cases with unsatisfactory outcomes in older children with most severe deformities, this technique may be used as a preparatory step for subsequent corrective arthrodesis. Бландинский В.Ф., Вавилов М.А., Складнева А.Л. Лечение детей с врожденной косолапостью по методу I. Ponseti / Материалы научно-практической конференции детских травматологов-ортопедов. - СПб., 2007. - С. 205-206. Клычкова И.Ю., Кенис В.М., Степанова Ю.А., и др. Алгоритм лечения врожденной косолапости у детей младшей возрастной группы // Ортопедия, травматология и восстановительная хирургия детского возраста. - 2013. - Т. 1. - № 1. - С. 21-25. doi: 10.17816/PTORS1121-25. Banta JV. Congenital Clubfoot: Fundamentals of Treatment. By Ignacio V Ponseti. Oxford: Oxford University Press; 1996. 140 р. doi: 10.1017/s0012162299220622. Dobbs MB, Corley CL, Morcuende JA, Ponseti IV. Late recurrence of clubfoot deformity: a 45-year followup. Clin Orthop Relat Res. 2003 Jun;(411):188-92. doi: 10.1097/01.blo.0000065837.77325.19. Леончук С.С. Результат лечения ребенка с врожденной рецидивирующей косолапостью методом Илизарова // Гений ортопедии. - 2013. - № 1. - С. 124-127. Weinstein SL, Flyn JM. Lovell&Winter’s Pediatric Orthopaedics. LWW, 2014;1-2:1829. Copyright (c) 2016 Kozhevnikov V.V., Voronchikhin E.V., Grigoricheva L.G., Radimova Z.N.